Camden Council has published landscape designs for a new public park at Alfred Place, a redesign for the existing Whitfield Gardens, and is seeking comments on the proposals this summer. Proposed view of Alfred Place looking south. Image: Camden Council/LDA Design. 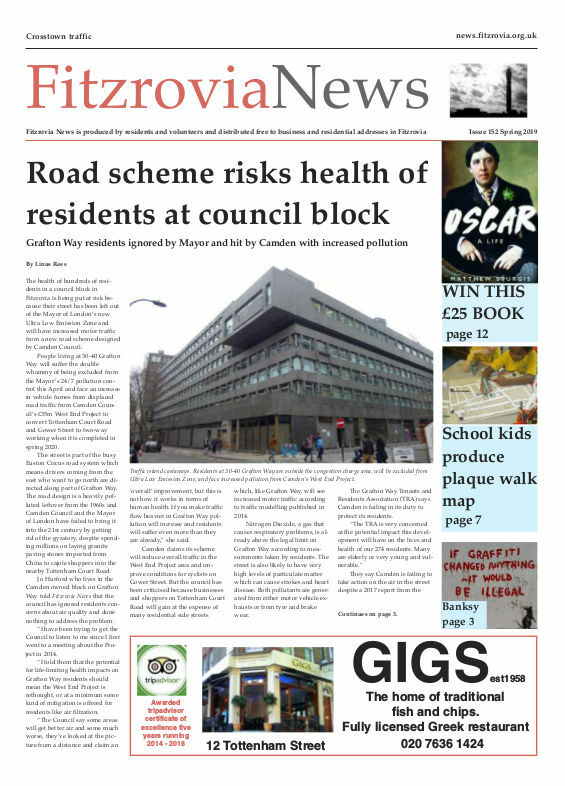 The scheme is part of a £35 million transformation of the Tottenham Court Road area — “the biggest Camden council-led transport scheme the borough has ever seen” and will address public demand for more public open space, improve air quality, and deal with traffic congestion and road safety, says Camden. The plans, produced by LDA Design, are available to view on Camden’s website but while they show lots of glossy images there is little in the way of detail or any accurate views expected of professional drawings. Proposed view of Whitfield Gradens. Image: Camden Council/LDA Design. The design for Whitfield Gardens appears to show an increase in hard surfaces and a reduction in greenery and the design for Alfred Place incorporates a loading bay as a central feature. The narrative accompanying the images says the public open spaces will meet “secure by design principles” and the graphic images show rows of cramped tube train-style seats with a few individual chairs. The brochure for Alfred Place proudly displays haemorrhoid-inducing granite seating — reminiscent of the notorious Camden bench, derided as the “perfect anti-object” and an example of “hostile architecture”. Whitfield Gardens is due to be closed this winter and open again in the spring of 2019 after the redesign. Work on Alfred Place is due to start at the end of 2019. “We will also transform Princes Circus in Holborn and Whitfield Gardens close to Goodge Street tube, both of which can be much improved. Working with LDA Design we will also create a string of pocket parks along Tottenham Court Road at Capper Street, Bedford Avenue, and Bailey Street. We are also adding over 20 new trees across the area. You can also visit the website www.camden.gov.uk/westendproject to the plans and email your comments to: westendproject@camden.gov.uk :: Deadline for feedback is 31 August 2018.